To begin, follow the instructions for setting up a new Web Export account. 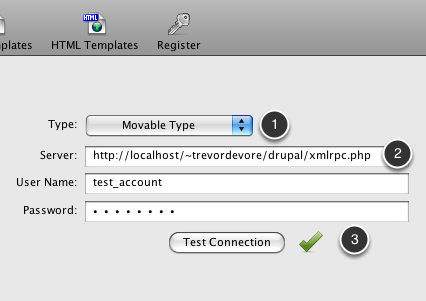 In order to post to Drupal you should configure a Web Account using the Movable Type API (1). In the root folder of your Drupal installation is a file named xmlrpc.php. The full url to the file should be entered in the Server field (2). Enter your user name and password and click Test Connection (3) to verify that everything is configured correctly. You can now post your lesson to Drupal following these instructions. Note that you should not check the "Post as Page" checkbox when uploading a ScreenSteps lesson to Drupal as Drupal does not support this. What Username/Password Should i user for "Movable Type"? I used my FTP account information but it does not working. Please help me. You need to use your Movable Type username and password, not your FTP username and password.